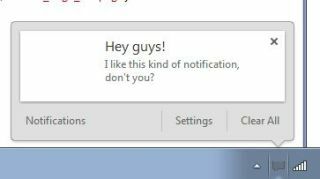 Google Chrome notifications have popped up once again in the latest update to the Chromium project, this time adding full notification center support. Chromium users can access the notification center by toggling the "Enable Rich Notifications" flag through chrome://flags. Doing so opens the doors to adding notifications to any Chrome extension, as well as working in conjunction with regular HTML notifications. Developer François Beaufort placed a post about the notification center update on his Google+ page, creating a sample notification complete with code to show how it can be done. Beaufort further speculated that the Chromium project's notification center could act as a central hub to bring Google Now cards to Chrome. Google Now has proven a popular addition to Android Jelly Bean, dynamically bringing users the most relevant information at any given time, such as traffic and weather reports while driving to work. Back in December, Chromium had already accepted a submission for skeleton code to implement Google Now in Chrome. The notification center could very well lead to the next stage in Google Now integration with Chrome, along with the added benefit of support for any Chrome extension. Perhaps even larger potential lies with what the notification center could mean for the Chrome OS, with Google Now cards bringing closer parity between it and Android OS for users.